A recent case, decided twice by the court of appeals, raises significant questions about maintenance modification law Wisconsin. In, Johnson v. Johnson, 217 Wis. 2d 124, 576 N.W.2d 585 (Ct. App. 1998)(Johnson I), the court of appeals made the seemingly astonishing holding that the “fairness” objective of maintenance (See LaRocque v. LaRocque, 139 Wis. 2d 23, 406 N.W.2d 736 (1987), does not apply to a post-divorce action. At first blush, it appears that this holding strips family courts of its equitable powers to do what is fair under the individual circumstances of a case. A closer reading, however, indicates that the intent of the holding may actually differ from the unfortunate language used by the court. In Johnson I, the court held that the fairness objective focuses on noneconomic contributions made during the marriage. In post-judgment actions, the issue becomes whether there is a substantial change of circumstances after the divorce. Thus, the LaRocque “fairness” objective (i.e., contributions during the marriage), does not apply to proceedings which focus on circumstances after the divorce. On remand, the trial court reduced its previous maintenance award by a mere $2.05 per week. The husband appealed, arguing that the trial court erred by setting maintenance above 50% of the total household income at the time of divorce. This time, the court of appeals upheld the trial court’s decision. Johnson v Johnson, 225 Wis. 2d 513, 593 N.W.2d 827 (Ct. App. 1999), (Johnson II). The Johnson II court stressed that the holding was intended to prevent a payee spouse from achieving a lifestyle “above and beyond the pre-divorce standard of living.” The court noted, however, that this holding was not based on a case where the maintenance was based on an anticipated increase in salary, such as occurred in Hefty vs. Hefty, 172 Wis. 2d 124, 493 N.W.2d 33 (1992), or other very unusual circumstances. Nonetheless, it is difficult to reconcile the Johnson cases with the holding of the supreme court in Hefty. In Hefty, the supreme court upheld a flexible percentage maintenance award which would thus afford a higher level of support if the payor’s income increased after the divorce. The court specifically held that “it is proper to consider the lifestyle that the parties could anticipate enjoying if they stayed married.” While the court limited its decision to situations where the parties could have reasonably anticipated increases in income, that is hardly a rare circumstance. Indeed, it would be anticipated that most payors who earn sufficient income for maintenance to be a factor anticipate higher income in the future. The Johnson cases are mainly troubling for the language in Johnson I regarding the fairness factor. It would boggle the imagination to believe that the court of appeals really intends to strip family courts, which are courts of equity, from considering what is fair in an individual case. If the court of appeals is defining fairness as “standard of living enjoyed the marriage,” this is far too restrictive to perform equity in many cases. For one thing, the facts of Hefty are not truly that unusual. Is it “very unusual” for a family to defer their present standard of living for future enjoyment or even comfort? Does this mean that a payee in a family which sacrificed its standard of living to save for childrens’ college or even retirement has sacrificed support after a divorce? Does the court of appeals intend to punish people who failed to overspend and live a lavish lifestyle during their marriage? Also disturbing are the cases where the parties sacrificed their standard of living during the marriage for education. In these cases, the standard of living enjoyed during the marriage was typically quite modest. The trade-off was that one spouse was preparing himself or herself for the future through education or training. 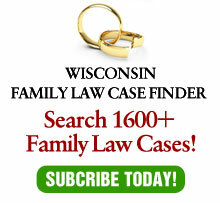 Wisconsin courts have held that the court can compensate the nonearning spouse through maintenance. See Haugan v. Haugan, 117 Wis. 2d 200, 343 N.W.2d 796 (1984); Roberto v. Brown, 107 Wis. 2d 17, 318 N.W.2d 358 (1982); Lundberg v. Lundberg, 107 Wis. 2d 1, 318 N.W.2d 918 (1982). Are the Johnson cases intending to overrule these holdings? Is fairness an issue under these circumstances? Of course, the best means of answering the questions raised by the Johnson cases is to avoid the issue altogether, through the use of I.R.S. §71 payments, which deprive the court the ability to modify support. Where the parties do not negotiate for I.R.C. §71 payments, however, it is hoped that courts read the Johnson cases narrowly, rather than truly eliminating fairness as a consideration in any proceeding, including modification of maintenance.